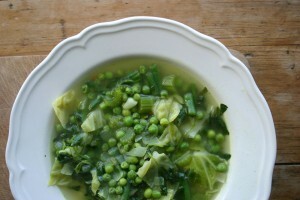 Sauté the leek and celery in a large saucepan over a low heat for 2 minutes until soft. Add the stock, zucchini, capsicum and kale or calvo nero. Simmer over a gentle heat for 10 minutes. Season with freshly ground white pepper if required.